There are many ways to kill the time, some people decide to learn skills, while others actually prefer to devote themselves to establishing bad habits, particularly those that harm their health. Maybe you find yourself in the middle, you may not like to spend time away from home or lack of skill, but you do not want to give your health with bad practices either. This being the case, it can be very useful to enter good humor sites, in fact, there are several reasons for this, such as the fact that you can learn about news with a touch of humor, share with others some fun things, develop your ability to be a humorist or simply laugh a lot –Keep in mind that laughing is the best medicine. 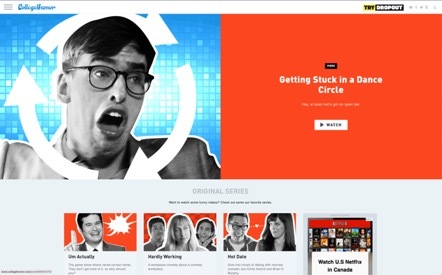 Among fun and comedy sites Cracked has gained a place because of its powerful dazzling content, but there is a wide world full of comedy out there how to stick to just one site. For this reason, we decided to give you this list with 5 good humor sites like cracked for you to spend some free time. To choose a perfect site you must know what you are looking for, many enjoy humor based on politics, sarcasm, and ridicule, to mention a few examples, while others prefer a more “healthy” mood. Based on that, look at our list. Then, consider other factors, such as whether you can subscribe and categorize the content you receive, how much you pay for the subscription or whether it is free, how often you update the content, to mention the most important ones. FunnyOrDie began in 2007when Will Ferrell and Adam McKay set out to make a video about a dirty-mouthed child who wanted their rent money. From that moment on, the site has clearly aimed to the publication of comedy videos. They greatly appreciate the real talent, so you can enjoy videos with celebrities, such as the aforementioned Will Ferrel, Zach Galifianakis or Charlize Theron, among others; In addition, ordinary people can publish their own videos. Also, as a user, you have the possibility to evaluate the videos on a scale of 0 to 5 and comment on them. We must mention that most of the videos request that whoever sees it is of age due to the type of humor, so even teenagers should be under supervision when entering this site. It has the support and collaboration of many celebrities. Humor is for adults, it is not pornographic, but you must definitely be of legal age to watch the videos. The categorization of the content is not clear. Dedicated mainly to photographic entertainment, theCHIVE was founded in 2008 by John and Leo Resig. This site is very easy to register on and interact, otherwise, you can only see the content. Although they are especially dedicated to photography, they do not rule out the use of videos, in fact, they are present in many social networks, in addition to YouTube. One of the strategies that helped them position themselves has been to carry out deception on the internet, one of the most famous was in 2007, when allegedly in Santa Monica Donald Trump paid an $82.27 bill and left a tip of $ 10,000, several news and entertainment networks published the news as true, although Trump himself finally denied this. It is a comfortable place to have fun if you do not want to spend time watching videos, instead you can laugh a lot watching pictures and very funny images and hilarious fake news. The possibility of making donations for charity. The section dedicated to users sharing their photos often includes explicit images. They have published false news, so they are not 100% for 100% innocent people. Wired was created in the USA as a magazine, offering both printed and online editions, and focused on how emerging technologies affect our culture, economy, and politics. It was founded in 1994 by Louis Rossetto, an American journalist. 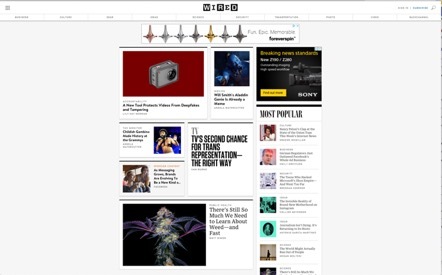 The website, also known as Wired News and HotWired, has different content such as articles, videos, and images, among other things, and is updated periodically. The current annual rate in the United States for a package subscription is $ 29.99; while digital type subscriptions are $ 19.99. In Canada, the current annual fee for a package subscription is $ 40. In other countries, the current annual rate for a package subscription is $ 70. They offer real information on different topics, such as health, politics, and technology, among others. Wide gallery of photos and videos. All the news you get here is true. The subscription is a bit expensive. You will get little humor here. 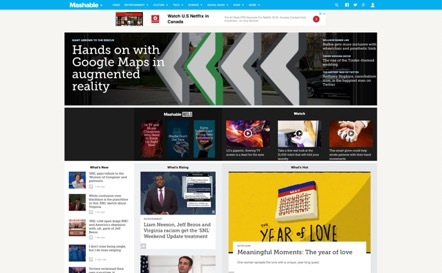 Much like Wired, Mashable is a global multiplatform media and entertainment company founded by Pete Cashmore in 2005, developed by its own patented technology. Its objective is to keep its users informed of the most important events in the fields of entertainment, memes, news about celebrities and technology, to mention the most outstanding ones. 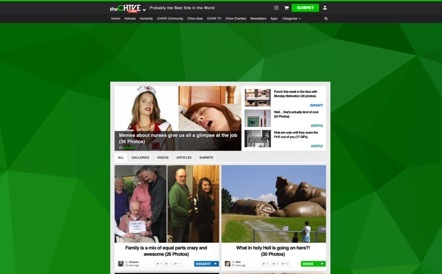 The strong integration that has developed this site with social networks, including Facebook and Twitter (you must log in with one), to post comments or discuss the news with other users and the informal touch that has the difference from many other similar sites also dedicated to cover current events. As a user, here you can follow topics on a regular basis or simply see a list of trends topics. The content here is varied and of great quality. Free service, although to upload content you need to register a user. They are continually updating the content. The fun content is not classified separately, so you have to look for it in the other categories. Low content dedicated to humor. Founded in 1999 by two high school friends, CollegeHumor Media offers daily comic content, which includes videos, photos, articles, and jokes, created and/or edited by CollegeHumor staff. Based in New York City they present original and very popular content, as well as the funniest and unconventional content on the web. Something very good is that this content is aimed at people with ages ranging from 10 years to 49 years old, so if you have children you should not worry about letting them explore the site. Besides, you can get a completely free subscription and, in addition, enter your online store, which in fact is very similar to an online sales platform, offering from products to online courses. Content suitable for children 10 years of age and older. The possibility of obtaining online courses at reasonable prices. Content varied and updated frequently. The section on love and relationships is not necessarily suitable for children. It is definitely possible to enjoy good humor on the internet by choosing the pages where you spend your time well, you do not have to use only social networks for that. 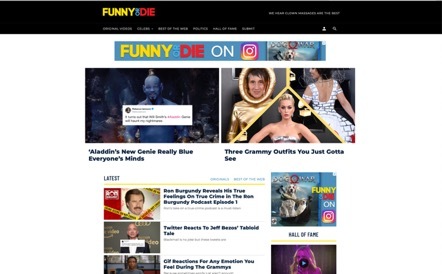 FunnyOrDie has an exceptionally fun content, it is not for less to have the collaboration of different important artists, in addition to the direct support of Will Farrel himself, although the humor is aimed at adults. If you are looking for a page that everyone can enjoy at home, then College Humor is what you are looking for, because they have excellent quality content and they pay careful attention to provide healthy humor, without detracting from the fun of the page. Try to find a balance point. It’s your decision, and now you have some great alternatives to the good old Cracked.